These two films were originally published separately on two DVDs as the 'Grass Roots Series'. The films were made by members of the Badsey Society under the leadership of Will Dallimore and the late Tony Jerram Here are the full credits. This combined DVD published by the Badsey Society, November 2012. This beautifully made film tells the story of traditional asparagus growing in the Vale. It explains the fast vanishing methods of cultivation, as well as describing the local approach to cooking, exhibiting and the manufacture of asparagus knives. Filmed over the course of a full year, this faithfully records the impact of the seasons on a traditional Vale orchard. 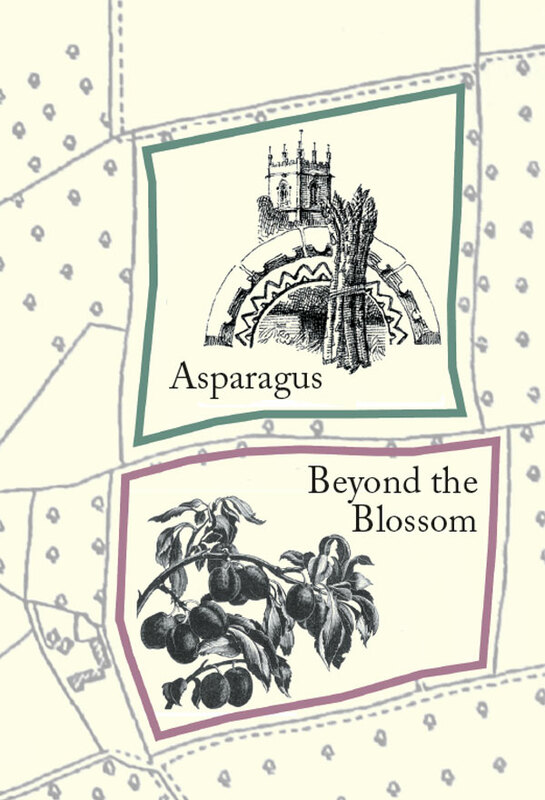 With the loss of plum varieties and orchards disappearing, it chronicles our vanishing local traditions in an entertaining and informative way. Here is the leaflet included in the box. 'Beyond the Blossom' and the Enclosure Map Project. Equipment varies, but after inserting the DVD, you should see a menu with 'Asparagus' on the left and 'Beyond the Blossom' on the right. If this does not appear, try pressing MENU on your remote control. Press 1 to play the 'Asparagus'. Press 2 to play 'Beyond the Blossom'.